It’s all about the dollars. About $16 billion in cash as I was told. If you follow the money all roads lead to Rome. Rome meaning law enforcement agencies. And they are not giving up the grand prize without a fight. I can’t quote names of sources or the cities they are from. What I can say is that in a private conversation with an extremely qualified big city law enforcement source I was informed that nationwide cops bag about $16 billion in cash seizures annually from pot users, dealers, & growers. That’s $16 Billion cash with a capital B. 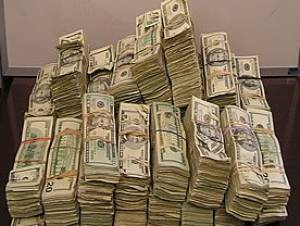 Just to clarify the 16 billion in cash is separate from the pot that is also confiscated in the bust. Legally the $16 billion in cash confiscations remains off the books. This money is separate from the local agencies’ yearly spending budgets. It’s found money that stays in their vault to be spent as they see fit. No. The cops spend the $50 million plus the $5 million of weed booty. Screw the tax payer. We’ll just keep it for our mad money fund. The $16 billion then can be spent for toys like ease-dropping equipment, mini tanks that can crash down house doors, etc. The agency doesn’t have to go to the city council and beg for money or justify why they need it to the media or voters. It’s easy money. A big score for them and 0 for the tax payer. The point is that if pot is legalized the $16 billion in play money goes away. Cops are not about to give those extra dollars up without a fight.